"...in serving the best interests of children, we serve the best interests of all humanity." -- Carol Bellamy. I am teaching a class of 114 8th grade students at a low income private school in one of the slums(Kamraj Nagar) of Ghatkopar, Mumbai, India. These kids come from families who have migrated from different parts of India looking for jobs and now settled in various slums like Kamraj Nagar, Netaji Nagar, transit camps, etc. in and around the school at Ghatkopar. The school, Modern English Medium School is situated deep into the community and is the only nearby and affordable English school available for the kids. Our school being a low income private school lacks the basic facilities and opportunites that are required for the kids to learn and grow optimally. Therefore their learning does not have the quality it should have when compared with the high income or governmennt aided schools. This is one of the major reasons why there is no major transformation in their lives and hence they continue as the second generation individuals in the jobs that their parents are doing. They are unable to explore and achieve their own potential and desires. I am a fellow at Teach for India and we here believe that every child has a right to achieve excellent education irrespective of their economic backgrounds. An excellent education involves the overall development of the child as an individual. We are trying to bridge the gap of education inequity in India. We have a high sense of possiblity for our kids and believe that amongst our 114 we might have the next president, prime minister, footballer, crickter, actor, IAS, Singer and the list can go on. We would appreciate if you could support our classroom financially and be a catalyst to the transformation in their lives as money stands as one of the major constraints in every initiative we plan or want to take up for our kids. You can be assured that the funds are strictly used only for the different activites or initiatives involving the kids and their learning. In case of any doubt you can also visit our school and be a volunteer in one of the many activites that we shall do with our kids and see that the the funds are used aunthentically. It would be a pleasure to have you with us in that case. Marian Wright Edelman says," If we don't stand up for children, then we don't stand for much." 1.Sports activites of the kids which include football, cricket, badminton and dodgeball as of now. We need to hire a coach for football and also require the supplies that we will need to play all these games. Given the lack of sapce in the community we do not want our kids development both physical, mental and emotional get compromised hence sports is a must for them. 2. 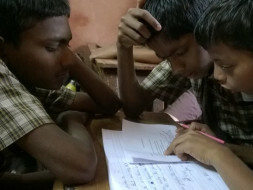 Our kids are in 8th grade now which means we need to arrange a lot of counselling, career guidance and afterschool tution support( this one for struggling readers and those with learning disability) so that they can make the right career choices and hence prepare and perform according to the requirements. We need to have tie ups or invite people who are skilled enough to support and therefore need funds for the same. We wish to build this support atleast for thye next three years till they finish their 10th. 3. Music and performing arts is a must for the holistic development of a student. We want to expose our kids and train them in this area so that they are able to develop better capability to express, understand and handle their emotions well such that it increases the quality of their thoughts and actions (given they come from difficult backgrounds). We have been trying to get people who are skilled and can help us but it has not been sucessful as we lack funds to pay the costs required for this. 4. To buy more books to set up a mini school library. 5. On field trips of the students as they remain unexposed to every other place and organization except their own slum. 6. To provide every possible opportunity to our kids in learning and exposure which we are unable to as of now due to lack of funds. 1. How do I know that my contribution is used appropriately? a. Please feel free to visit our school/community and volunteer. b. We can send you the pictures and regular updates through mail about the different activites done with the kids and their performance thereafter in academics. 2. How can I Support in more ways? Please drop us a mail regarding your interest at veenu.saini2014@teachforindia.org. Do not forget to mention your skills. 3. What kind of background students have? Students come financially weak backgrounds where paying the monthly fees which is Rs 350 a month is also a great challenge. The parents are not much educated and work as auto rickshaw drivers, vegetable sellers, maids, etc. The environment these kids are exposed to afterschool in the community is very unsafe and unsuitable for them. We therefore want to invest their maximum time in various productive activities afterschool. Location: Prayag Chawl, Kamraj Nagar, Near Eastern Express Highway, Ghatkopar (East), Mumbai - 400077.